The Sensation series offers more slice count options. Systems are available in 4, 10, 16, 40, and 64-slice versions. The Emotion series comes in 1, 2, 6, and 16-slice versions. All Sensation CTs are water-cooled and generally require an outdoor chiller. All Emotion CTs are air-cooled. This difference gives the Sensation advantages in terms of system cleanliness and overall room noise and the Emotion an advantage in terms of maintenance costs, as there are no chiller-related services needed. 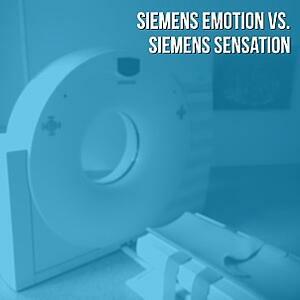 Sensation scanners have a larger overall footprint than Emotion scanners. They also require some outside space for placement of the chiller unit. Being smaller, the Emotion series is often a better pick for facilities with space constraints. The Sensation series comes with either a Straton tube (8.0 MHU) or an Akron Q (5.3 MHU). The Straton (on some 16s, and all 40s and 64s) is very expensive to replace, but the Akron Q (on 4s, 10s, and some 16s) costs much less. The Emotion series uses Dura X-ray tubes; the Dura 202 or 302 for single-slice units, the Dura 352 for dual-slice, and the Dura 422 for 6 and 16-slice scanners. The Dura 422 costs more to replace than an Akron Q, but still considerably less than a Straton. Given the higher heat capacity of their X-ray tubes, Sensation series scanners have an advantage working in high-volume facilities. If your facility has a more moderate patient volume level, an Emotion scanner can save you both money and space. Both of these series began manufacture in 2000; the Sensation at the 4-slice level and the Emotion at the single-slice. The Emotion 16-slice version arrived a couple of years after the Sensation 16 so, at that slice count, the Sensation is likely to be the older system. If you polled 100 Siemens CT users on which of these scanners is better, I suspect the results would be 50/50. Depending on your site’s specialties, space availability, and patient throughput, both the Sensation and Emotion series have their own niche to fill. If you still have questions about the best CT scanner for you, our team is ready to help you decide. And- if we were wrong about how entertaining this information has been, don’t worry- Lifetime has another riveting tale of romance and tragedy cued up every couple of hours. Paul Crawford is the Product Manager for CT Scanners at Block Imaging. In addition to his role here, he is also a husband and a father of two. Paul believes the biggest value a business partner can provide is a partnership built on trust and strives to earn that trust with transparency in every conversation, project, and transaction he’s a part of.